AMTK 6011 Was @ C.P. Huntington Chapter NRHS for a while. I remember it and sister C&O 1510 sitting on blocks in their yard. Thanks, ETA, for the info on #1505 and #1510! The #1510 is now owned by Arizona Transit Assembly (ATAX) and was/is operating on the Lancaster & Chester, currently configured as a table car. Anyone know if the #1505 is still owned by the Collis P. Huntington Chapter, or was it also sold? Thanks in advance! Ordered in May 1944, delivered between February and October 1946. 64 seat coaches. Ordered in March 1944 and delivered between November and December 1947. Steam generator #1921, built in 1955 by EMD in Order #2072 as UP E9B #967B, sold in 1972 to Amtrak as #467, converted in 1975 by ICG to steam generator #1921. After the wreck, the #1921 remained in service and was renumbered in 1977 to #671. #671 was sold in May 1983 to the Michigan Northern, and later ([color=#0080FF]when?? [/color]) went to the Illinois RY Museum before being acquired ([color=#0080FF]when?? [/color]) by the Wisconsin & Southern, which restored it to an E9B as #102 in 2008. Baggage #1058, built in 1957 by Budd in Lot #9601-209 as AT&SF baggage-express #3544, sold in 1971 to Amtrak as #1058. After the wreck, the #1058 was converted to HEP in 1978 as #1227, but I don't know if the #1058 was in service between the wreck and the conversion date, or if it was stored for that length of time. Anyways, the #1227 was wrecked on the westbound #5 [i]California Zephyr[/i] in Fraser Canyon near Granby, CO, on April 16th, 1985. 5DB sleeper-22 seat buffet lounge-crew locker #3253 [b]City of Cleveland[/b], operating as crew dormitory. Built in 1950 by P-S in Lot #6867 to Plan #4169 as NKP #150, to N&W, sold in 1971 to Amtrak. After the wreck, sold in November 1977 to Rod Basich as the #800050 [b]Montecito[/b] (Laguna Hills, CA). Later ([color=#0080FF]when?? [/color]) acquired by American Orient Express as crew dormitory-diner lounge [b]San Francisco[/b], transferred in 2008 by Xanterra to the Grand Canyon RY. Sleeper #2068. The thing is, there was no sleeper rostered by Amtrak as #2068. In fact, the only lightweight sleeper that I know of that was #2068 was CN ex-NYC 22RM sleeper #2068 [b]Valpoy[/b] (built as NYC #10422 [b]Delaware Bay[/b]), but this can't be the car in question for 3 reasons: 1, the only revenue sleeper on a long-distance train would not have been an all-roomette car; 2, CN, as far as I know, didn't lease any equipment to Amtrak; and 3, the #2068 had been rebuilt as 14RM dormitory-baggage #9480 in 1973! That being the case, this sleeper [i]could have been[/i] either ex-UP 11DB #2268 [b]Placid Valley[/b], ex-AT&SF 4DB-4C-2DR #2368 [b]Regal Ruby[/b], or nee-SAL 10RM-6DB #2768 [b]Portsmouth[/b]. #2268 was retired in July 1981 and sold in 1982 to Anbel Corporation, then to SCD in 1983 as #731 [b]Aranjuez[/b]; #2368 was retired in 1979 and sold to the "Vassar Junction Playhouse" in Vassar, KS, and was later ([color=#0080FF]when?? [/color]) acquired by an "R. Bryan" and moved to the Midland RY Historical Assocation (Baldwin City, KS); and the #2768 was retired in 1977 and sold to Ampol Wrecking in Indianapolis. Based on these retirement dates and the disposition of the #2768, I'm concluding that this 3rd car is the sleeper in question. The [b]Portsmouth[/b] was built in 1949 by P-S in Lot #6796 to Plan #4140A as SAL #28, later SCL #6620, and interestingly, was 1 of 4 10-6 sleepers SCL sold to Amtrak as wreck replacements after a wreck in December 1971 retired 4 ex-SCL cars (3 chairs and a baggage-dormitory), which were returned to SCL and likely stripped of all usable parts before scrapping. The cars sold were 2 nee-ACL [b]County[/b]-series cars (in 1971) and 2 nee-SAL cars (in 1974). 60 seat chair #6010, built in 1948 by Budd in Lot #9673-017 as C&O 36 seat chair-8 seat smoker #1504, sold in 1950 to SAL #6227, reconfigured in 1954 to 50 seat chair, to SCL #5130, sold in 1971 to Amtrak #5000, seating increased to 60 in 1974 as #6010. "Amtrak by the Numbers" lists that the #6010 was transferred to the MofW department as #10605, but the #10605 was actually the ex-#6040, exx-#5233, nee-AT&SF #3161. Like the sleeper, diner, and all but 1 of the other chairs, after the wreck the #6010 was likely sold for scrap to Ampol Wrecking. 60 seat chair #6051, built in 1955 by AC&F in Lot #04-4403 as L&N #3255, sold in 1971 to Amtrak. Sold later in 1976 to Ampol Wrecking. 56 seat chair #5623, built in 1946 by Budd in Lot #9613-005 as FEC [b]Dania[/b], sold in 1965 to SAL #6258, to SCL #5623, sold in 1971 to Amtrak. Sold in 1977 to Ampol Wrecking. 60 seat chair #6011, built in 1948 by Budd in Lot #9673-017 as C&O 36 seat chair-8 seat smoker #1505, sold in 1950 to SAL #6228, reconfigured in 1954 to 50 seat chair, to SCL #5131, sold in 1971 to Amtrak #5001, seating increased to 60 in 1974 as #6011. "Amtrak by the Numbers" lists that the #6011 was not sold until May 1986 to an unknown party. Current status/location unknown. 60 seat chair #6059, built in 1955 by AC&F in Lot #04-4403 as L&N #3263, sold in 1971 to Amtrak. Sold later in 1976 to Ampol Wrecking. 50 seat chair-snack bar #3958. The sleeper in question listed as 2068 was mostly likely former UP 10-6 "Pacific Crest" which carried the same name under Amtrak ownership with the number 2608. A 10-6 was standard fare on No. 58 and 59 in those days. Ordered in March 1944, delivered between October 1946 and March 1947. 56 seat chairs. #2953 to PC #2953, sold in 1973 to Amtrak #5685, retired in 1983. Current status unknown. I recently acquired a slide of the #5685 in Pittsburgh, taken by Jay Brown in October 1990. While I don't know who acquired the car, this does confirm that it was sold and not scrapped. First, some additional info for diners previously included in this thread that were sold to NdeM, from Robert J. Wayner's "The Cars That Went to Mexico". #691 to #3662 Piedras Negras. #692 (which according to Link, had been previously transferred to the MofW department in 1965 as #X-23475) was initially planned as #3671 Playa el Dorado, but instead became #3663 Sabinas. #693 was initially planned as #3672 Playa Encantata, but instead became #3664 Saltillo. #694 was planned to become #3673 Playa Hornos, but instead it was retained and renumbered to PC #4545, and was then sold in 1973 to Amtrak as #8029; retired in 1976 and sold for scrap to Ampol Wrecking in Indianapolis, likely scrapped on site at Beech Grove. #695 was initially planned as #3674 Playa Icacos, but instead became #3665 Uruapan. #696 was planned to become #3675 Playa Mirador, but itstead it was retained and renumbered to PC #4546, and was then sold in 1969 to the Choo Choo Hilton in Chattanooga and named Lillie and McCall, Inc. Current status unknown. #697 is listed by Randall as sold to Jones Properties, and it was initially planned as #3676 Playa Pie de la Cuesta, but instead became #3666 Dolores Hidalgo, and was later renamed Veracruz. #698 was planned to become #3677 Playa Revolcadero, but instead it was retained and renumbered to PC #4547, and was then sold in 1969 to the Choo Choo Hilton, with no name listed. Current status unknown. #699 was planned to become #3678 Playa Rosarito, and it is listed by Randall as sold to Jones Properties. Current status unknown. #442 was sold in 1966 to Edwards International, and became NdeM #3657 Apatzingan. #443 became NdeM #3658 Cuatro Cienegas; likely via Edwards International (the retirement date is 1966). #445 was sold in 1966 to Edwards International, and became NdeM #3659 Santa Cruz Analco. Ordered in December 1945 and delivered between July and August 1948. Although Randall states that these 4 cars were not articulated to their kitchen halves, he does say that the cars were permanently coupled, and the NYC diagram shows that these pairs were equipped with full-width diaphragms. When built, these 4 cars had 68 dining seats: 2 traditional dining sections at either end of 6 4-seat tables, with a center section consisting of 12 pairs of 2-seat semi-circular, aisle-facing booths with small tables, 6 per side. These cars were later modified, with 2 of the 4-seat tables (at the end opposite from the end attached to the adjoining kitchen car) replaced by a 6-seat waiting lounge. The even-numbered cars built for the 20th Century Limited (attached to the Lot #2186 kitchen-lounges) were modified in 1954; the odd-numbered cars (attached to the Lot #2187 kitchen-dormitories) were modified in 1950. The end attached to the kitchen had a preparation/cabinet area. The listing of which cars were paired together comes from Randall. However, looking at the retirements listed by Link for #403 and kitchen-dormitory #474, I'm thinking that the #403 was paired with this car, not #475. #400, paired with #476. To PC #4584, retired in 1971 and scrapped. #401, paired with #474. Listed by Link as retired in May 1965 and sold to Speno RR Ballast Cleaning. Listed by Randall as retired in 1960 and scrapped. Current status unknown. #402, paired with #477. To PC #4585, retired in 1971 and scrapped. #403, paired with #475. Listed by Link as retired in March 1966. Listed by Randall as retired in 1960 and scrapped. Ordered in December 1945 and delivered in August 1948. I don't have a copy of the diagram for these 2 cars, so I don't know what the dormitory capacity was. #474 listed by Link as retired in March 1966, listed by Randall as retired in 1960 and scrapped. #475 listed by Link as retired in October 1965 and transferred to MofW department as #X-23453. Listed by Randall as retired in 1960. Interestingly, Randall also lists that this car was transferred to the MofW department, but only gives the Conrail MofW number of #45905, and that it was assigned to Detroit. Ordered in December 1945 and delivered in August 1948 for the 20th Century Limited. 23 lounge seats, but with no club counter. #476 to PC #4586 retired in 1971 and scrapped. #477 to PC #4587 retired in 1971 and scrapped. 4 of 8 such cars ordered by the C&O in November 1946, delivered in August 1950 to C&O but not used, sold to NYC same year. Included 2 6-bunk crew dormitories (2 3-bunk sets per room) and 2 steward's rooms (with both lower and upper berths). C&O #1952 Michies Kitchen to NYC #470, sold in October 1956 to IC #4127A, retired in 1968 and sold to the Gilchrist Tractor Company (Jackson, MS). Scrapped at an unknown date. C&O #1953 Hanover Kitchen to NYC #471, sold in October 1956 to IC #4128A, retired in 1968 and sold to David Wallace (San Antonio, TX). Current status unknown. C&O #1956 Caldwells Kitchen to NYC #472, sold in February 1957 to B&O #1093, retired in 1969 and sold to the Shay Inn Restaurant (Cass, WV). Current status unknown. C&O #1957 Botsford Kitchen to NYC #473, sold in February 1957 to B&O #1095, retired in 1969 and sold* to unknown party, later (when?? **) acquired by the Washington Central RR (WCRC) as #156 for the planned Atlantic Clipper Dinner Train on the NYS&W, sold in 1997 (with the rest of the cars acquired for the Atlantic Clipper) to BC Rail (BCOL) #156 for the Pacific Starlight Dinner Train and named Savoy, sold in 2004 to Ontario Northland as #907 Savoy. *Listed by Randall as scrapped in 1969. **I'm guessing that this car might have been part of the Texas Southern (and later Transcisco Tour's Texas operation) fleet, and was among the engines and cars purchased from Transcisco Texas by the Washington Central. This would make the WCRC acquisition date 1993. However, there might be an error with the disposition of this car: the other C&O car acquired by WCRC (later BCOL and now Ontario Northland) is the former Botsford Tavern (last car in the section below), which was formerly owned by David Wallace in San Antonio. The kitchen-dormitory that Wallace owned was the former Hanover Kitchen, and I'm wondering if this car is now the Savoy, not the Botsford Kitchen which, if Randall is correct, was scrapped in 1969. 4 of 8 such cars ordered by the C&O in November 1946, delivered in August 1950 to C&O but not used, sold to NYC same year. When built, these cars had 64 dining seats; NYC reduced seating to 52. When acquired from NYC, B&O increased the seating in their 2 cars back to 64, and IC increased the seating in their 2 cars to 68. C&O #1975 Michies Tavern to NYC #409, sold in February 1957 to B&O #1092, retired in 1969 and sold to the Shay Inn Restaurant. Current status unknown. C&O #1976 Hanover Tavern to NYC #410, sold in February 1957 to B&O #1094, rebuilt in 1969 to instruction car #IN604. Current status unknown. C&O #1979 Caldwells Tavern to NYC #411, sold in October 1956 to IC #4127, retired in 1968 and sold to the Gilchrist Tractor Company, later (when??) sold and used as an antique store (Madison, MS), sold in 2009 to a scrap dealer (Flowood, MS) and scrapped in 2012. C&O #1980 Botsford Tavern to NYC #412, sold in October 1956 to IC #4128, retired in 1968 and sold to David Wallace. Later (when?? *) acquired by the Washington Central RR (WCRC) as #155 for the planned Atlantic Clipper Dinner Train on the NYS&W, sold in 1997 (with the rest of the cars acquired for the Atlantic Clipper) to BC Rail (BCOL) #155 for the Pacific Starlight Dinner Train and named Apollo, sold in 2004 to Ontario Northland as #904 Apollo, resold (when??) to D.A. Walmsley & Company (DAWX) as #1407. *I'm guessing that this car might have been part of the Texas Southern (and later Transcisco Tour's Texas operation) fleet, and was among the engines and cars purchased from Transcisco Texas by the Washington Central. This would make the WCRC acquisition date 1993. Ordered in March 1944 and delivered between November and December 1947. When built, these cars had a total of 47 seats: 25 in the lounge section and 22 in the club section (2 4-seat tables, 4 2-seat tables, and 2 3-seat booths with small tables, facing the club aisle). In 1966, cars #38 and #39 had 5 of the lounge seats replaced by coat and luggage racks for parlor service. According to Wayner, it was originally planned to sell 5 of these cars to NdeM, however, as listed below, only 2 cars, #35 and #41, were actually sold, and Link lists a third car that was sold, which was not one of the original five. Randall lists these cars as buffet lounges, whereas Link lists these cars as tavern lounges; the NYC diagram shows a club counter next to the table seating. #35. Listed by Randall as wrecked in 1964, listed by Link as retired in September 1964 and sold to SCD, listed by Wayner as sold to NdeM as #376 Club Azteca. #36 listed by both Randall and Link as rebuilt in September 1963 to 53 seat automat #601, listed by Randall as wrecked in 1966, listed by Wayner as planned for sale to NdeM as #377 Club El Chamizal, sale cancelled. #37 listed by Wayner as planned for sale to NdeM as #378 Club Puebla, sale cancelled and car retained, to PC #4437, to NJDOT in 1976 as #4437, later NJT #5450, acquired in 1987? by URHS as #5450, later (when??) renumbered URHX #4437 and named Alex DeCroce, then (when??) returned to NYC #37 and leased to the Cape May Seashore Lines. #38 to PC #4438, sold in 1976 to Amtrak as #3346, transferred in 1977 to MofW department as #10310, later (when??) sold to the C.P. Huntington Chapter NRHS, used in charter service as PPCX #800655. #39 to PC #4439, to NJDOT in 1976 as #4439, later NJT #5451. Current status unknown. #40 listed by Wayner as planned for sale to NdeM as #379 Club Queretaro, sale cancelled and car retained, to PC #4440, to NJDOT in 1976 as #4440, later NJT #5452. Current status unknown. #41. Listed by Randall as wrecked in 1967, listed by Link as retired in September 1964 and sold to SCD, listed by Wayner as sold to NdeM as #380 Club Tamaulipas. #42 listed by both Randall and Link as rebuilt in August 1963 to 53 seat automat #602, listed by Randall as retired in 1967 and scrapped. #43 to PC #4443, to NJDOT in 1976 as #4443, later NJT #5453, acquired in 1987? by URHS, restored and mechanically upgraded, used in charter service (often with Hickory Creek), currently part of NKP #765 consist. Does anyone know this car's #800xxx-series number? Thanks in advance! #44 to PC #4444, sold in 1976 to Amtrak as #3347, transferred in 1977 to MofW department as #10311. Current status unknown. #45. Listed by Randall as retired in 1964 and sold to Strates Shows, listed by Link as retired in September 1964 and sold to SCD. This car is not included in Wayner's book, and I'm thinking that the info given by Randall is the correct disposition for this car. Current status unknown. #46 to PC #4446, to NJDOT in 1976 as #4446, later NJT #5454. Current status unknown. #47 to PC #4447. Current status unknown. First, a note on club lounges #36 and #42: when reconfigured to automat cars #601 and #602, these cars were placed in NYC Lot #2258. Ordered in December 1945 and delivered between August and September 1948. When built, these 2 cars had 30 lounge seats, a secretary's office, a telephone, barber shop, and shower. When sold in February 1959 to the Rock Island, the number of seats in the lounge was reduced to 24, the secretary's office was modified to a 2-seat card room, and the barber shop was modified to a 4-seat card room. In 1961, Rock Island increased the number of lounge seats to 28. Under Rock Island ownership, the shower and telephone were not used. #10572 Atlantic Shore renumbered in August 1958 to #10703, to CRI&P as #481 and renamed Pacific Shore, retired in 1975 and sold to Kennedy Farms in Clear Lake, IA, later (when??) acquired by the Western New York RY Historical Society. #10573 Lake Shore renumbered in August 1958 to #10704, to CRI&P as #482 (same name), retired in 1971 and sold to Stainless Processing in Chicago. Ordered in March 1944 and delivered in February 1948. 53 seats. Sold in 1960 to KCS as #44-#47, reconfigured/renumbered (2nd time) in 1963 as #40-#43 (nonconsecutively), with an 8 seat lunch counter replacing the bar and 32 seats in the lounge. All 4 cars were retired in 1970 and sold, as KCS passenger operations had ceased in 1969. Link lists the retirement date for these 4 cars as December 1959. Most of the information for these 4 cars comes from a post made by Greg Slaton in the "Budd Observation Cars" thread. #48 to KCS #44 (1960) to #43 (1963), sold in 1970 to Wiley Johnson for the Red Caboose Restaurant, which was located on Arnoult Rd. in Metairie, LA. After the restaurant closed, the property was used by several additional businesses before the car was sold (when??) to J.F. Williams (from Texas). Williams had the KCS paint removed, the holes from the restaurant patched up, and named the car Starlight Forty-Eight, but Greg was unsure if this car was ever placed into service. In the late 1990's, it was sold to Artrain as ARTX #105, but was not used in service. Work was slowly done on the car, while it was parked at Midway Station in the Twin Cities. Artrain then (when??) moved the car to their HQ in Ann Arbor. It was listed for sale for a while, but without any takers, and photos show that during storage in Ann Arbor, this car has been repeatedly tagged with graffiti; no idea on if there has been any vandalism beyond that. #49 to KCS #45 (1960) to #42 (1963), sold in 1970 to Brewton Lumber near Winnfield, LA. Brewton had a conference table installed, and the mill was later sold to Louisiana Pacific. In the 1990's, after the Winnfield mill closed, the car was moved to the mill at Urania, which was later sold to Georgia Pacific. This mill closed in circa 2004, and in 2008, the car was moved again, this time to the mill in Gloster, MS. This mill also closed, and burned in 2012, but the car was not damaged. That same year, it was sold at auction to Jon Clark, and was moved to Metairie, LA, parked next to Pete Messina's shop. #50 to KCS #46 (1960) to #40 (1963), listed by Randall as sold in 1970 to William B. Stewart/Riley Boosters Club. Greg said that this car was acquired by a fan club of the James Whitcomb Riley in Indianapolis, and ran on that train to Chicago and back. It was then (when??) sold to James E. Strates Shows, but Greg wasn't sure if it was used in their circus train, and as of 1976 it was in Taft, FL, in use as an office. In the late 1970's, it was sold to John Hickman and Phil Jenkins. John and Phil moved the car to Baltimore in circa 1980, and it was stored at the B&O Museum. In the Summer of 1980, parts were removed from KCS #43. John and Phil lettered this car as NYC #48, and it was used in charter service (as #800083) out of D.C. and Chicago. This car also saw use on both the Branson Scenic and Arkansas & Missouri. Amtrak later seized this car for lack of payments, and John and Phil subsequently sold this car to Les Kasten, who picked it up at New Haven. In circa 1995, Les traded this car to MARC for several RDC's, and it was lettered MARC #1. MARC had PRR trucks placed under the car (to match their ex-PRR Budd commute coaches and parlors rebuilt from 21RM and nee-N&W 10RM-6DB sleepers), and in 2000-2001 it was located at Riverside Yard in Baltimore. In 2002, MARC began leasing this car to the B&O Museum, and it was donated in January 2009. #51 to KCS #47 (1960) to #41 (1963), sold in 1970 to William "Bill" Dodd, former Louisiana Lieutenant Governor. It was moved to his property outside of Clinton, LA, and used as a playhouse (for his grandchildren) and for entertaining. Dodd passed away in 1991, and in 1994 his sons sold the car to Leroy Harvey, who moved it to his Southern Belle Antiques at the corner of Charter and Race Streets in Jackson, LA, for use as a tearoom. Ordered in March 1944 and delivered between April and June 1948. 30 parlor seats and 10 lounge seats in the observation end. Regarding the 2 cars acquired by Amtrak: the parlor seating was replaced by 40 coach seats, and seating in the lounge area was increased to 15. Regarding the cars sold to NdeM: Wayner lists that these cars were acquired in 1961-1962. Wayner also states that NdeM replaced the parlor seating with additional lounge seats, and installed a mid-car bar, which had ice blocks to keep drinks cold. #58 retired in October 1959 and sold to NdeM as #356 Club La Laguna. #59 listed by Link as retired in October 1959, listed by Randall as retired in 1958, listed by both as sold to NdeM, listed by Wayner as #351 Club El Bajio. #60 listed by Link as retired in July 1964 and sold to Ringling Brothers, listed by Randall as sold in 1968 to Judge Roy Hofheinz for the planned Astrodomain hotel in Houston, acquired in 1972 by Amtrak as #3870, listed by Warner and Simon as retired in October 1981, listed by Palmieri as sold in 1983, reported by Jerry LaBoda as stored on the Los Angeles Junction RY with the L.A. County cars as of 1978, now located in San Francisco along the former WP. Location reported both as at the intersection of 16th and Rhode Island Streets, and as 300 De Haro Street. The other Budd round end lounge observation at this location is SAL #6602/SCL #5842/Amtrak #3342. This car is not included in the 1966 diagram folio, so sale to Ringling Brothers, then resale to Hofheinz might be correct. #61 listed by Link as retired in August 1966 and sold to KCS, listed by Randall as retired in 1965 and sold to Johnnie's Vets Club in Des Moines, IA. Later (when??) acquired by Denver Railcar as DRCX #9061, then sold (at the 2004 auction?) to the Delaware & Ulster. #62 listed by Link as retired in December 1957, listed by Randall as retired in 1958, listed by both as sold to NdeM, listed by Wayner as #357 Club Norteno. #63 listed by Link as retired in December 1957, listed by Randall as retired in 1958, listed by both as sold to NdeM, listed by Wayner as #352 Club Central. #64 listed by Link as retired in December 1957, listed by Randall as retired in 1958, listed by both as sold to NdeM, listed by Wayner as #353 Club Coahuila. #65 listed by Link as retired in December 1957, listed by Randall as retired in 1958, listed by both as sold to NdeM, listed by Wayner as #355 Club Chihuahua. #67 listed by Link as retired in October 1965 and sold to Ringling Brothers, listed by Randall as sold in 1968 to Judge Roy Hofheinz, acquired in 1972 by Amtrak as #3871, listed by Palmieri as retired in 1980, listed by Warner and Simon as retired in February 1981, and listed by Randall and Simon as scrapped in Los Angeles in 1981. This car is not included in the 1966 diagram folio, so sale to Ringling Brothers, then resale to Hofheinz might be correct. #68 retired in May 1958 and sold to NdeM as #358 Club Zacatecas. #69 listed by Link as retired in December 1957, listed by Randall as retired in 1958, listed by both as sold to NdeM, listed by Wayner as #350 Club Aguascalientes. #70 listed by Link as retired in May 1962, listed by Randall as retired in 1961, listed by both as sold to NdeM, listed by Wayner as #354 Club Cuitlahuac. NYC 48 sold from Artrain to Durbin and Greenbrier Valley in January 2013. Photos of it on Railroadfan.com with DVGR markings. Became DVGR 48. Also, when I was talking to Les Kasten in 2011 regarding his NYC "Brook" Series car he was selling, he had told me when there was inadequate work done on the observation end or something to that extent. Not sure if that's true, but that's what I had been told. Thanks, James, for the update on the #48! Concerning the Brook-series car you mentioned, which I'm assuming is the #10562 Fall Brook, there was a thread (started in 2011) concerning this car, with some reports that there had been serious damage to the car during a fire at Illinois Transit Assembly several years back. However, Les Kasten posted that the damage was minimal, the interior was not removed due to fire damage, but to determine if there had been damage, and that there was little damage to the actual structure and siding of the car. Therefore, this car, despite its empty shell status, is actually in good shape. 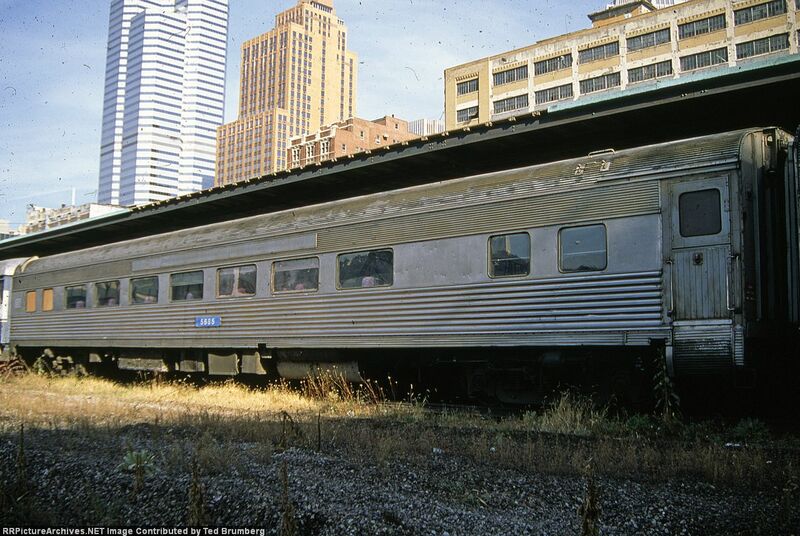 However, if the stripped Fall Brook is not the car you're thinking of, there was/is another Brook-series car at ITAX, the Wingate Brook, which unlike the Fall Brook, has the raised rear observation lounge with the high windows, very similar to the P-S-built Hickory Creek and Sandy Creek. Also, the interior and side paneling of the Wingate Brook are intact. Your welcome Ted. NYC 48 was a staple for those of us Detroit area NYC fans as well as "Babbling Brook" which kept her company for many years at the New Center in Ann Arbor, right down the road from me. I was the one trying to buy "Fall Brook" in that thread about 4 years ago, but could never work out a proper deal, or seem to get anyone to go out and get a full car inspection done. I remember him mentioning something about the #48 as well after Artrain gutted it and did some of the rebuild work and something being a-miss, but again, I cannot recall what that was. And that got me in contact with the late Dean Levin and got to learn quite a bit about his endeavors with his NYC 448. Amazing man. Thanks, James, for the clarification! #10624 Boulder Stream renumbered in May 1966 to #656 to PC #7164 to #4419 (number listed as not applied by Palmieri, not listed by Warner) sold in 1974 to Amtrak, intended as #3776 (number listed as not applied by Palmieri, not listed by Warner) to #3208 (number listed as not applied by Palmieri). Retired in October 1981 and sold in 1983 to private ownership #800002. Current status unknown. #10626 Woodland Stream to PC #4412 sold in 1971 to Amtrak #3201. Retired in October 1981 and sold in 1983 to [color=#BF0000]private ownership? ?Rich Kostura in Pittsburgh, PA[/color], later (when??) to Orrville Railroad Heritage Society #800332/Glen Bowman, who also owns PRR Lounge Car Paul Revere (Orrville, OH). Did this car receive ORHZ reporting marks? #10626 Woodland Stream is owned by North Coast Line, Inc, Orrville, OH, Glenn Bowman, President and carries reporting marks RPCX 10626. 10626 was never owned by Orrville Railroad Heritage Society or under ORHZ reporting marks. NCL purchased from Rich Kostura 2011. Glenn Bowman, North Coast Line, Inc.
#10627 Swift Stream renumbered in May 1967 to #660 to PC #4415 sold in 1973 to Amtrak #3204. Retired in October 1981 and sold in 1983 to private ownership?? [color=#BF0000]Michael Fox[/color] and located at the Midland RY Historical Association (Baldwin City, KS), later moved to Los Angeles and LEASED TO UNCOMMON JOURNEYS renamed City of Angels (1st) (#800460), then sold (when??) to second private owner. Acquired (2007) by NYC Investments - Birmingham, AL - operated by Mid America Railcar Leasing. #10628 Laurel Stream to PC #4413 sold in 1971 to Amtrak #3202. Retired in October 1981 and sold in 1982 to private ownershipNEW ORLEANS NRHS - Messina and Tilton #800180, later (when??) acquired by [u]IFE LEASING, name changed to City of Angels (2nd). on the side of a car anymore, Mid America offered more than reasonable usage terms for equipment owners looking to make equipment roadworthy. That's why there are so many MRLX cars rostered. Thank you, Glenn, for the clarifications regarding the Woodland Stream! Swift Stream was bought from Amtrak by Bill Owen, Brecksville, OH. Car stored indoors at former NYC Collinwood shops for several years. Car later sold to Mike Fox, who put the car back together (it was missing a ton of parts) and got it Amtrak Certified. I'm not clear on the current ownership but I believe it has been renamed Swift Stream now for some years.